This has been a beautiful week! For the first time in recent memory, our annual trip to an apple farm was done wearing shorts and t-shirts. And we’re not complaining! We’ll take this summer-like weather as long as we can get it. So to keep up the guise of summer, we’ve been enjoying the end of summer’s harvest with our meals. Today’s recipe is reminiscent of our trip to Michigan in August. On the last afternoon of our vacation, we enjoyed a wonderful gourmet pizza at a local winery. We’ve since recreated it at home several times. 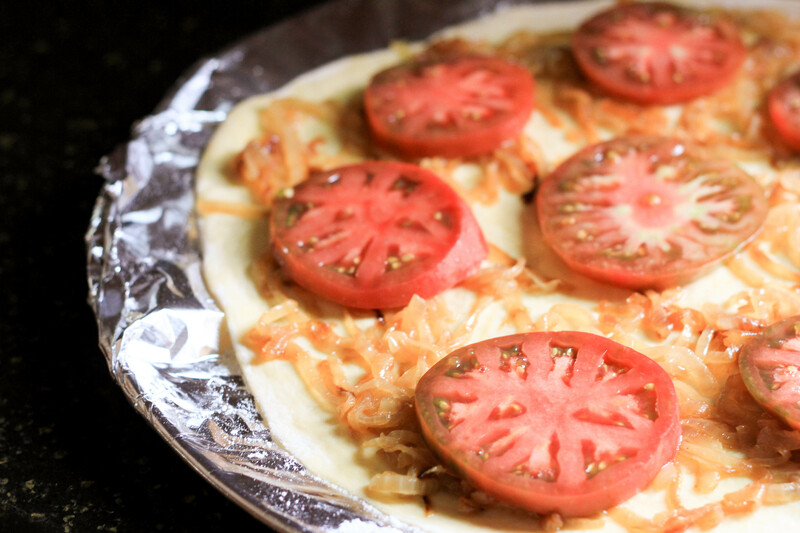 While the prep time is a little lengthy, Mike and I think this Summer Harvest Pizza is worth the effort. We start the meal prep early in the day by making a semolina pizza crust. We use my bread machine to simplify the process. The dough recipe makes enough for three large pizzas. We make one for Mike and I, one for the kids and then ten mini-pizzas for the kids to take in their school lunches. 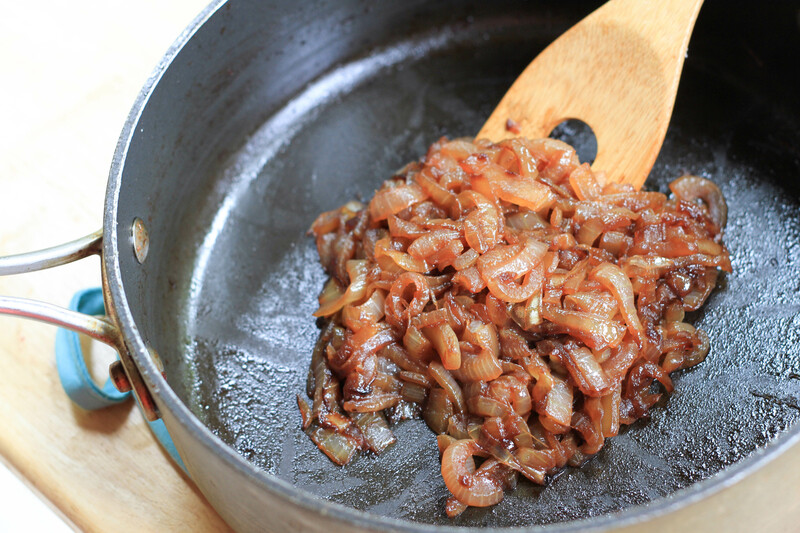 Later in the day, about an hour before dinner, we begin the remainder of the prep, starting with caramelized onions. Next, we prepare the figs. We’ve used several different recipes off the web as guidelines. (Like this one or this one.) 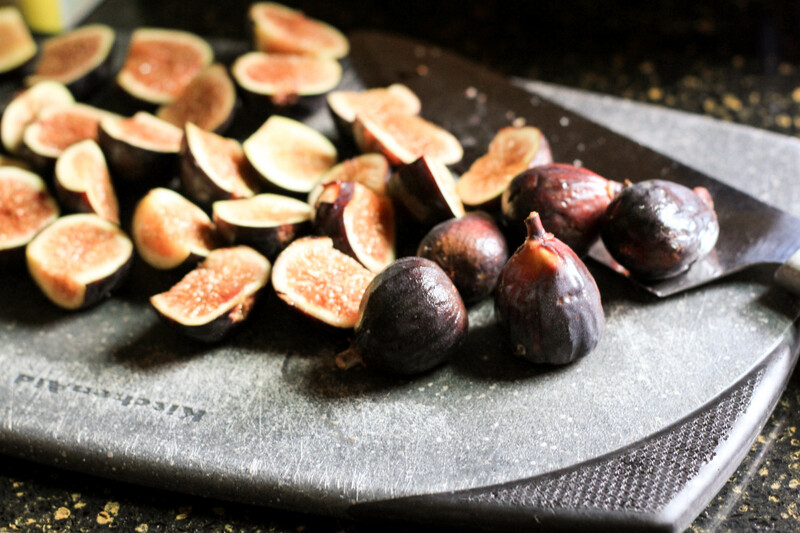 After cleaning and slicing the figs, we toss them into an oven-proof dish. We drizzle them with honey, balsamic and a bit of brown sugar. We then bake them for 20 minutes at 400F. 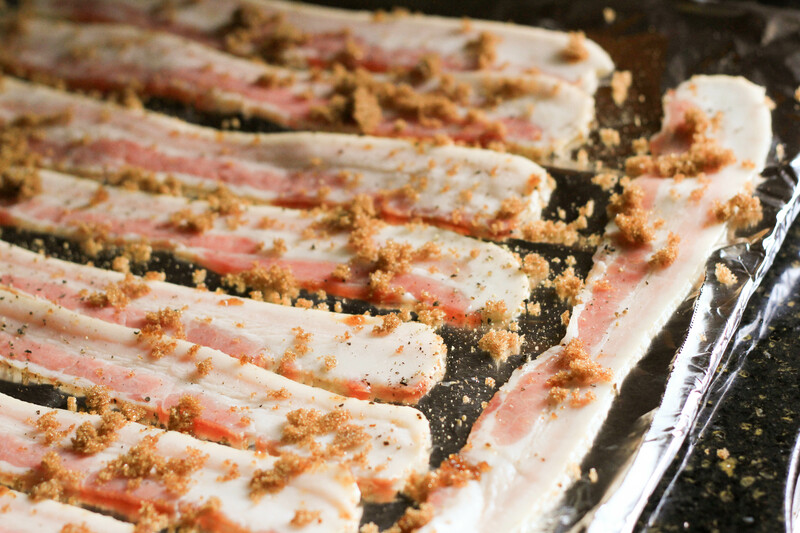 Next up comes the candied bacon. This was not included on our pizza in Michigan, but after reading it over at Rufus’ blog, we knew it had a place on this dish. The recipe is so simple, we’ve made it several times (dangerously simple). Both the figs and the bacon cook up conveniently while the onions are doing their thing on the stove. Then there’s only one last thing to do before assembly. Slice the heirloom tomatoes. 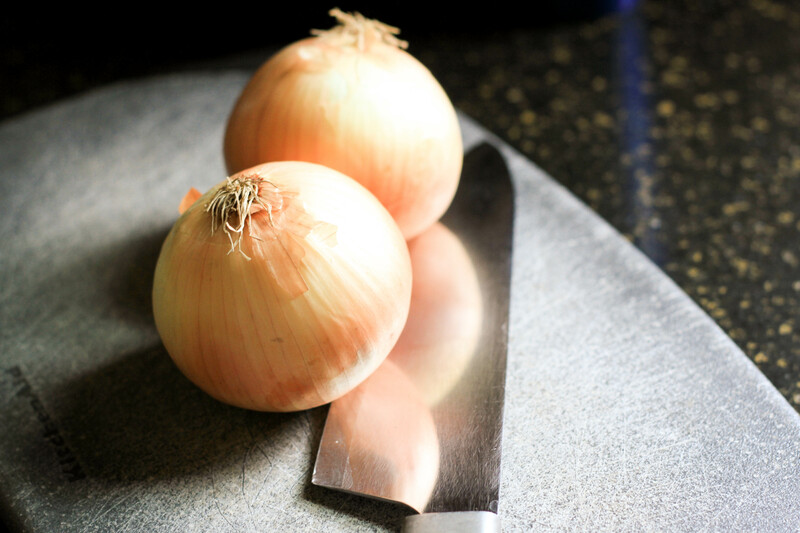 The onions usually take about 45-60 minutes. Once they are done, we roll out the dough and place it on a pizza tray lined with parchment or foil, and sprinkled with corn meal to prevent the pizza from sticking. Then we brush the pizza crust with olive oil and begin to pile on the ingredients. We like to start with the onions, followed by the tomatoes. Next we add the figs, a few handfuls of arugula, the candied bacon bits and a sprinkle of goat cheese crumbles. You can also add a fresh squeeze of lemon juice at this point as well. We’ve done both with and without and either way was equally enjoyable. The pizza then bakes for 15-20 minutes at 400F. 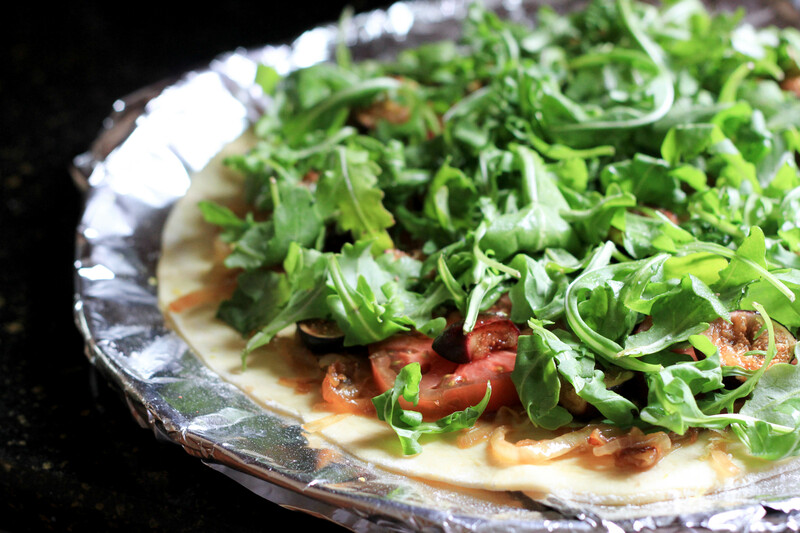 Once the crust is golden brown and the pizza is nice and hot, we remove it from the oven and sprinkle a bit more fresh arugula over the top. Then we slice and serve. I like to add a bit of balsamic reduction over the top just prior to serving as well. Adds that extra bit of sweet tang to the dish. Mike and I both thoroughly enjoy this tribute to summer on a pizza. It’s packed with a variety of flavors and textures – a true delight to the taste buds. Mike and I both give it a solid 3 spoons. It’d be tough to get a homemade pizza to rank 4 spoons – we grew up on Chicago-style pizza after all. That said, it’s a good gourmet-style pizza that we’ll surely make again. The kids, however, weren’t into this one at all. Far too many visible vegetables for them. They opted for a more traditional sauce and cheese pizza one night and a pesto pizza another night. That’s fine by us – more slices for us! I found a good batch of figs at the market recently, so this last time I roasted a triple batch. I’ve frozen them along with some slices of heirloom tomatoes in hopes that they’ll work over the winter. I would love to have this pizza in the middle of January. It may not be summer then, but a good bottle of wine, the fireplace and the taste of summer on a pizza…sounds like a nice winter evening to me. Now, I suppose we’ll start moving onto fall…somewhat reluctantly, although I admit I do love fall cuisine. I’m going to have Mr. N pick our next country to cook from this week. So we’ll be back in a week or two with his choice and a dish to go along with it. Have a great week everyone! PS. I’m so envious that you actually live close enough to Cecelia that you can go and visit her and the Farmy…I bet she has the most beautiful kiwi accent ever! I’m allergic to onions but it look AMAZING! What a different and tempting pizza. Would you believe that I never saw a fig at the market this year…I don’t know why. Fall Greetings Kristy…I am a long-time member of the Farmy Fellowship (where I found your blog) and just wanted to say I’ve tried a few of your recipes and they have been wonderful…I’m anxious to try the oat crust quiche. 🙂 Also just wondering what town that beautiful farmhouse is in that you rent each summer…I am a native Michigander! 🙂 That looks like either Lake Michigan or Lake Huron but I’m guessing Lake Michigan as there are alot of peach orchards up there! Yum, my favorite summer fruit!! This pizza looks divine. And you had me at hello with the figs and bacon lol. I’ve definitely missed commenting on your wonderful blog. I’m going to try making this with my daughter. Can you pls share your pizza base recipe? Thank you. Absolutely – The recipe is from “The Bread Lover’s Bread Machine Cookbook” by Beth Hensperger. Place the wet ingredients in the bread machine first, followed by dry and then set your bread machine to the dough setting. When the dough setting is complete, remove the dough, separate it into desired number of services. I divide it into thirds and it makes three 12″ pizzas. Once divided, knead the dough for a few minutes and shape it into balls. Cover with a damp cloth and let rise for another 30 minutes. Once risen, you can place in the bags in the fridge for up to two days or in the freezer for up to three months. Or shape them immediately and top with ingredients. If you store them in the fridge/freezer, let them rest at room temperature before use. Hope you enjoy it. 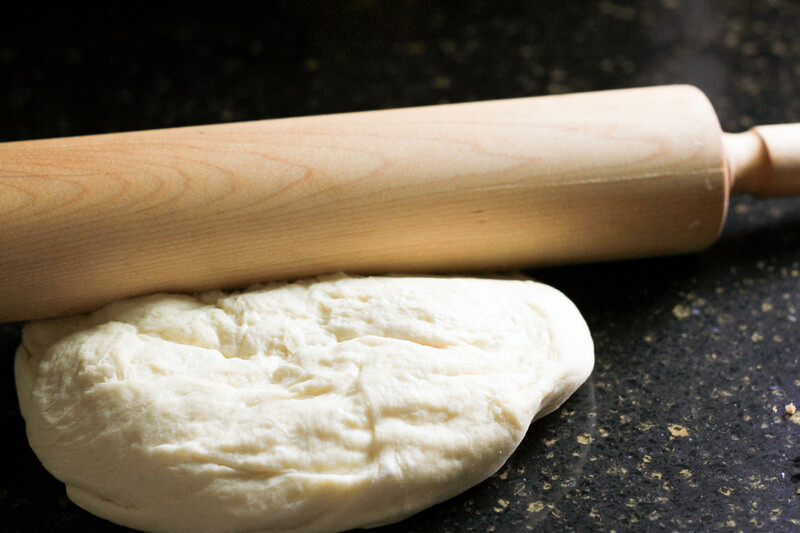 The dough recipe is great for all pizzas. The kids really like it for traditional pizza and pesto pizza. Thank you for your prompt reply! I’m definitely gonna give it a try. Anything with figs is my favorite… But this looks absolutely amazing! I’ll be trying it this week! 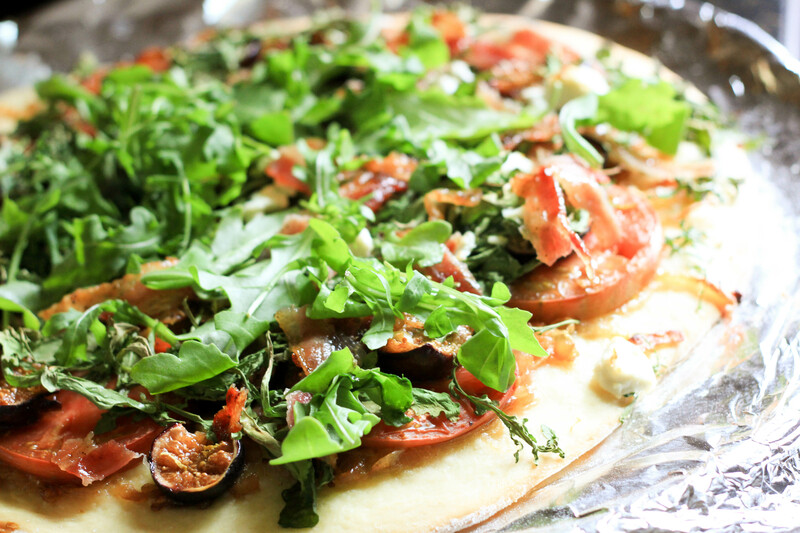 Stellar toppings and so much fun for the kids to make together on a weekend. 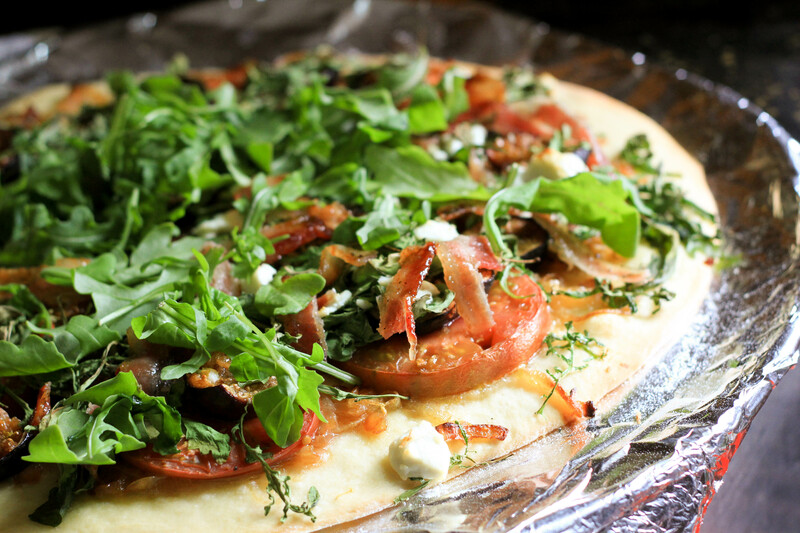 Caramelized onions, candied bacon, figs… drooling! What a yummy sounds pizza! Highlights summer flavors, but still seems pretty hearty. 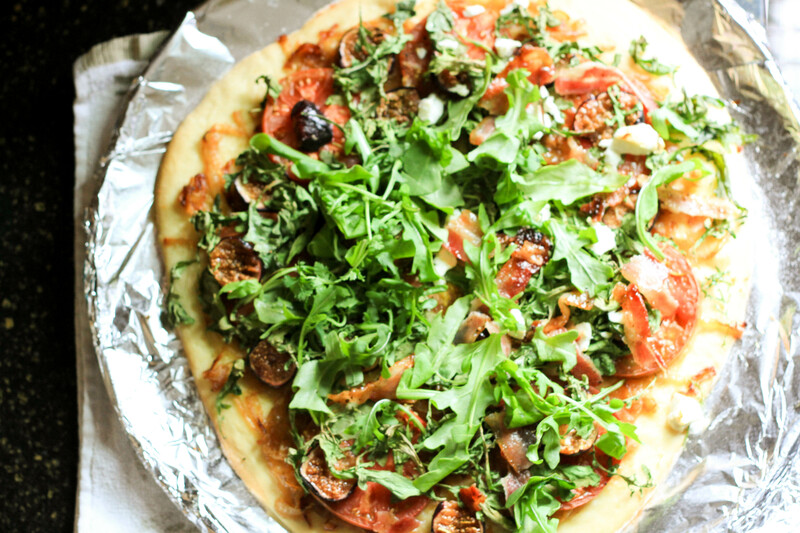 I’m a big fan of arugula on pizza, too. This looks AMAZING. I love figs but I have never tried roasting them by myself – next on my to do list! 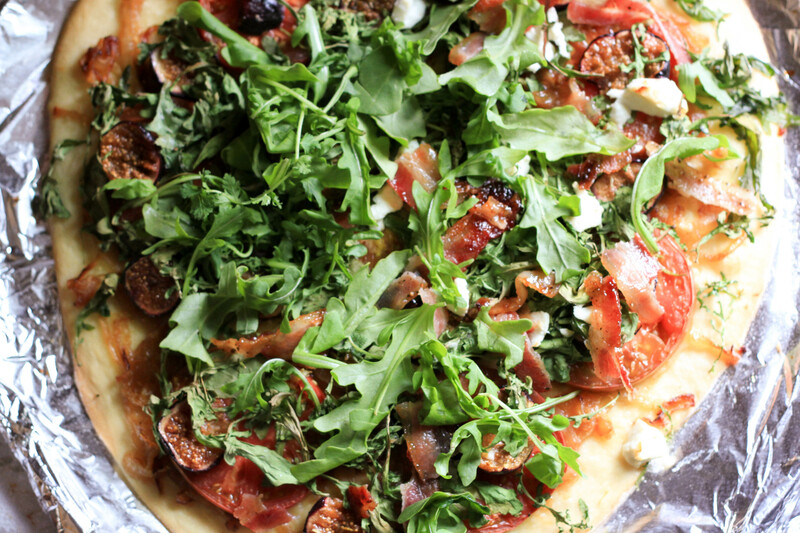 We adore homemade pizza and this one sounds like a real winner. We usually bake the crust one side first then flip, dress and bake again. I’m a wee bit surprised that you added sugar to the figs, I would have thought they’d be sweet enough after you baked them. Summer pizza in the middle of winter sounds awesome, I’m doing the same thing for sure. I think my kids would be the same way – I hope you are enjoying the beginnings of fall! this is one heck of a pizza and I love all the flavors in it. There is nothing better than caramelized onions and figs together. It is sweet and salty and nutty and i love it! Looking forward to learning how you liked the frozen roasted figs and tomatoes. 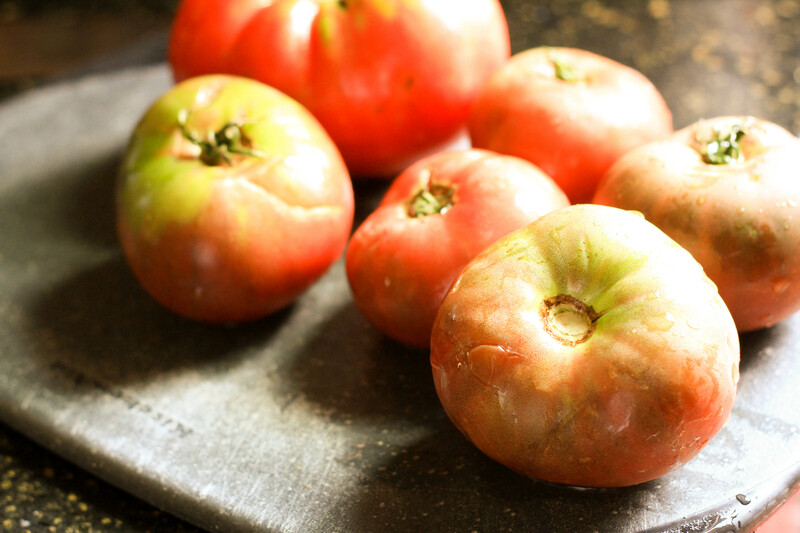 Did you oven roast your heirloom tomatoes before freezing? I was thinking: Why not freeze some caramelized onion also? Saving your recipe for next year when I have figs and heirloom tomatoes. Beautiful photo sequence Kristy. Anything with fresh fig and caramelized onion is worth the effort in my view and I agree, I would enjoy this pizza any time of year! So happy you are being treated to an extra long summer… by all accounts, late September has been gorgeous. Just in time for a very special birthday ♡. It look delicious!! Love the combination of the ingredients, so unexpected!!! Oh my gosh can I please come over and eat this? Sounds delicious. I’m definitely going to make it. What a magnificent pizza! I love the combination of wonderful flavours! This sounds SOOOO amazing! I so want to try. Question – do you bake it with the arugala? It doesn’t look “cooked” in the photos, and I have never cooked with it before, so was wondering. Love the peppery taste though! Thanks for sharing! Thanks for the tip and reply. I’ll have to try.